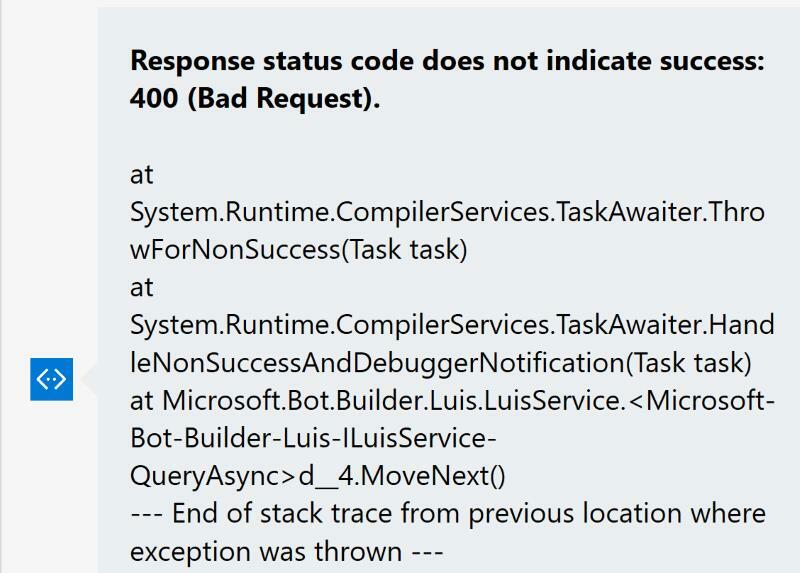 During your time building and debugging your botframework chatbot, you’ve probably already come across the annoyance of seeing a huge error message with a ridiculous stack trace that doesn’t seem to relate to your error, or even just a plain old HTTP 500 and big red exclamation mark.. In order to capture the short, top level, exception only, we need to wrap the root Dialog with an exception handling one; let’s start with that. When an exception occurs within your root dialog you’ll either see nothing (i.e. an HTTP 500 error) or a huge stack trace. To try to handle both of these scenarios, we need to wrap the root dialog with an exception catching one. This will actually capture the top level exception, and optionally return it as a message; just configure displayException to be true when debugging and false when deployed. You can also add in logging in the catch section of the ExceptionHandlerDialog. Now your real exception should be both exposed and summarised. Next let’s override the default error message. This requires a little detective work, digging into the code in the GitHub repo. Let’s get our Sherlock hats on! We need to override this and have our own class resolved for the IPostToBot interface instead. However, we still need all of the other “wrapper” dialog tasks, so it’s actually easier to copy and paste this into our own AutoFac module, just changing that one line. Notice the line which previously registered PostUnhandledExceptionToUserTask now uses our own PostUnhandledExceptionToUserOverrideTask. That new file looks like this – should be very familiar! Now that we’ve got a new implementation for IPostToBot it has to be wired up in order to override the default one from DialogModule.cs. To do this, put the following code wherever you already do your IoC, or in the Global.asax.cs if you’re not doing it anywhere else yet. 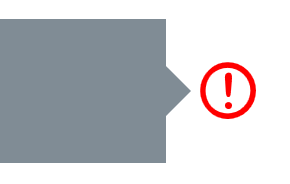 With these changes in place you can finally avoid scrolling through many screens of stack trace that doesn’t give you any useful information, and customise the friendly error message sent to your user. Great post and just what I was looking for. Thank you! Hey Robin, i was trying to implement this feature. But am getting below error message. Can you please help? Exception: Cannot create an instance of ExceptionHandlerDialog`1[T] because Type.ContainsGenericParameters is true. man is this code still valid? Not completely, no; the IPostToUser has changed, and the ability to override IoC registrations more easily has been added too.